By now, there’s probably little chance you haven’t seen the new weight classes that were announced by the International Weightlifting Federation (IWF) in early July. 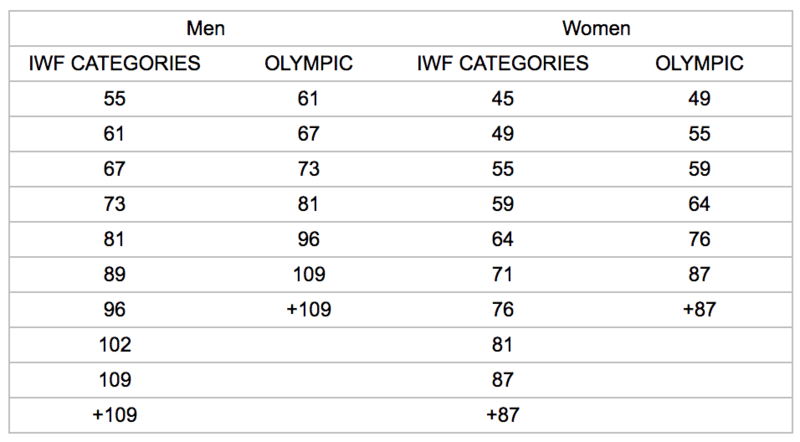 These new weight classes will be contested at this year’s IWF World Championships and the 2020 Tokyo Olympics, along with major international/national competitions taking place on the back half of 2018 and moving forward. Any time new weight classes are implemented in strength sports, new record standards need to be set. This means that previous records held for different weightlifting federations will be modified to account for the new weight classes, which in turn will work as new record standards. New standards are configured using historical data, various mathematical equations which account for things like previous records, an athlete’s weight during the time of setting the record, the lift itself, and other factors. Many of the weight classes have similar record standards to what we saw prior to 2018, but there are a few sizable differences. Check out the new American Record Standards for Junior & Senior athletes here! In USA Weightlifting’s press release, they discuss that they’re still working to develop Youth and University record standards. The first time these new standards and weight classes will be tested for American athletes will be at the American Open 3 Series being held September 13-16th. For those who haven’t seen the new weight classes, then we’ve included them below! Outside of the new weight class changes, weightlifting has a whole has gone through multiple changes in the last couple years. To read more on what’s changed, check out this article.